Eric W. Sponberg, retired naval architect, once owner of Sponberg Yacht Design. Particularly well-known for sailboats equipped with free-standing rigs. Also did significant designs for powerboats and motoryachts. Final boat design was an ocean-going rowboat for rowing solo, non-stop, across the Pacific Ocean. 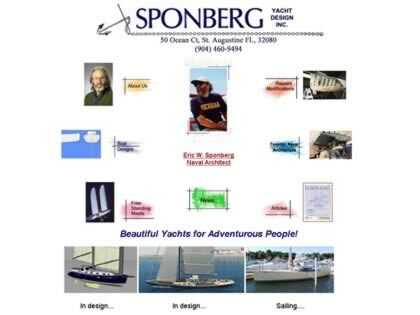 Web Site Snapshot: If available, above is a snapshot of the Sponberg Yacht Design web site at https://www.ericwsponberg.com/ as it appeared when this site was added to the directory or last verified. Please Note that Boat Design Net has no involvement with the above web site; all content and images depicted in the above thumbnail are the property and copyright of Sponberg Yacht Design unless otherwise noted on that site. Description: Eric W. Sponberg, retired naval architect, once owner of Sponberg Yacht Design. Particularly well-known for sailboats equipped with free-standing rigs. Also did significant designs for powerboats and motoryachts. Final boat design was an ocean-going rowboat for rowing solo, non-stop, across the Pacific Ocean.